There are a few ways to rid your garage or workshop of old power tools. To properly recycle your old power tools you can try to send the tools back to the manufacturer, recycle the tool's rechargeable battery, donate your tools or sell them. According to Bosch, each of its power tools is at least 87 percent recyclable. Contact your nearest power tool dealer or service center to see if it will recycle your tool for you. Some companies, including Bosch and Festool, allow consumers to drop off their old power tools at one of their dealers or service centers to be properly disassembled and recycled. Remove the rechargeable battery and recycle it separately if your the manufacturer won't recycle your tool. In most cases, a rechargeable battery is the most harmful part of the tool to the environment. DeWalt regularly accepts and recycles rechargeable batteries of all kinds and even gives cash-back coupons good toward the purchase of new rechargeable tool batteries. Retailers including Lowe's and The Home Depot also recycle rechargeable batteries for consumers. To find a recycling location, visit the website of Call 2 Recycle and enter your zip code. If it still works, give your old power tool to a friend or family member or donate it to a thrift store or to a charitable organization. Visit the website Earth 911 to find organizations that accept power tools. Organizations such as Rebuilding Together also accept power tool donations and use them to build and repair homes. In addition, you could be eligible to deduct the donation on your taxes. Hold a garage or yard sale. 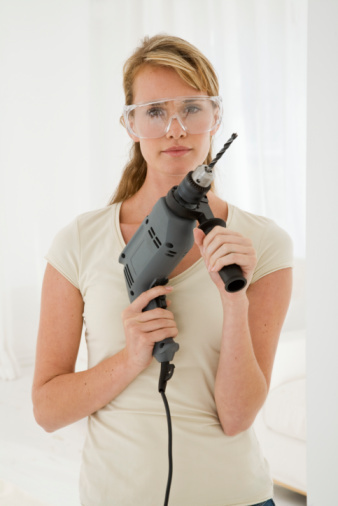 The older the power tool or the more outdated it is, the lower you should price it. It is best to keep most items at a garage sale under $10. You can charge more than $10 for your old power tool but have a good reason to justify the high price. If you want to charge more than $20, consider placing an ad for the tool in a local newspaper on a free classifieds website such as Craigslist.